What is another word for refers? Recalls, seeks, covers, signals, says, Does, Forms, Referred. 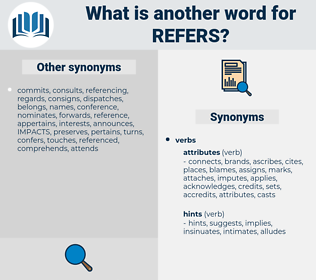 purposes, Referrals, Addresses, cross-references, reports, forwards, expresses, remits, Gestures, Areas, indications, returns, notes, baselines, improvements, concerns, benchmarks, Criteria, lists, comments, states, displays, signs, touches, deals, holds, pertains, Recalls, signals, Referred. Suggesting, returning, Noting, Embodying, sending, detailing, Securing, marking, pointing, dealing, signaling, Stating, according, showing. covered, Forwarded, directed, Returned, worn, focused, focussed, devoted, Brought, Carried, Dealt, linked, Got. 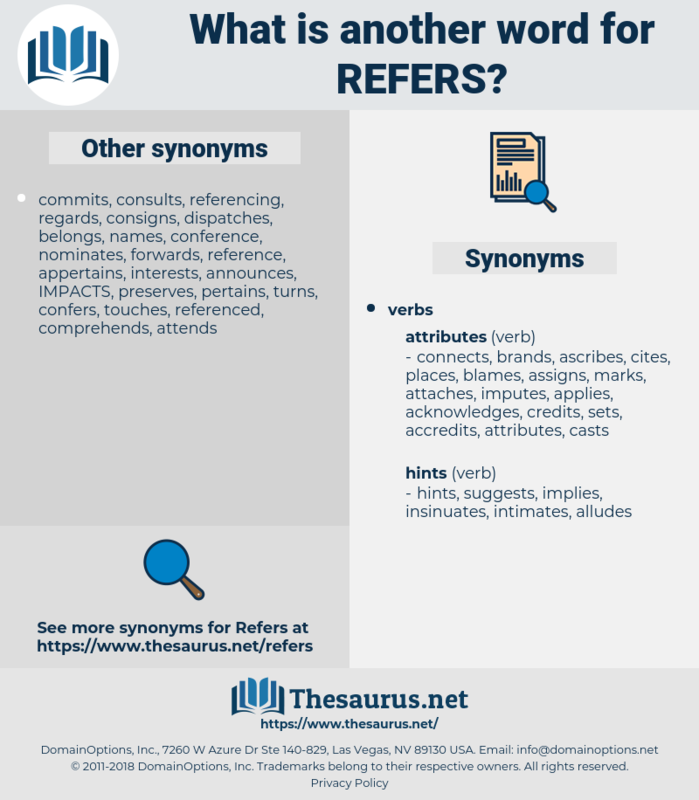 defers, describes, offers, transfers, matters, reaffirms, removes, represents, renders, differentiates, refuses, resembles, reminds, reiterates, recognises, revolves, recommends, testifies, remembers, categorizes, characterizes, considers, commemorates, recognizes, remarks, restates, exists, suggests, administers, definitions, regarding, regards, replicates, recovers, symbolizes, responds, emphasises, rejects, illustrates, concentrates, summarizes, encompass, encompasses, signify, explains, repeats, reproduces, regroups, classifies, connotes, evaluates, contemplates, explores, delivers, fosters, specifies, enforces, encapsulates, reveals, derives, features, invokes, gathers, files, summarises, caters, distinguishes, appears, relegates, accommodates, Replies, resonates, enshrines, stresses, professes, resorts, Records, involves, resumes, definition, enters, correspond, remands, integrates, receives, stipulates, demonstrates, Consultations, writes, parallel, parallels, authorisation, clarify, clarifying, clarifies, treats, Guarantees, argues, assimilates, portrays, implements, equates, answers, enumerates, contributes, symbolises, presupposes, discloses, consolidates, respects, allocates, encourages, advises, confirms, embraces, articulates, turns, correlates, communicates, permission, direct, directing, directs, oversees, depicts, employs, translates, presents, insinuates, postpones, highlights, feels, follows, epitomizes, retains, celebrates, encloses, agrees, negotiates, alleges, increases, examines, operates, coincide, coincides, is, performs, anticipates, discusses, embodies, counters, quotes, disseminates, prescribes, dismisses, informs, interacts, associate, Activities, assigns, introduces, concludes, governs, labels, defining, declares, arises, invites, checks, affirms, belonging, belongs, linkages, outlines, transmitting, transmits, converts, uses, proceeds, forecasts, shares, urges, contends, starts, implies, manages, complements, proclaims, advocates, assesses, brandishes, withholds, catalogues, instructs, evokes, conveys, conforms, handles, Rests, adheres, warns, promotes, befits, predicts, Affects, overlaps, dedicates, betrays, captures, observes, submits, Focuses, focusses, sends, overlies, underscores, attests, fulfills, guidance, underlines, Penalties, exhibits, fills, endeavours, threatens, helps, strives, tackles, entails, constitutes, attracts, Bears, earns, conjures, contacts, spells, collects, concurs, abides, presentation, effects, ensures, opposes, arrives, source, deserves, aspires, Queries, accepts, Trafficking, combines, assumes, purports, stems, pleads, stores, supports, Deems, Faces, lies, selects, seizes, exposes, prepares, -, reports, believes, alerts, satisfies, occurs, broadcasts, authority, Drives, tells, adverts, Strikes, depends, spends, elects, aligns, touch, Carries, SITS, chooses, separates, moves, ranges, engages, cares, creates, lead, leads, hears, raises, centres, adjust, imposes, Grips, complies, asks, employee, Indices, adopts, falls, poses, forwards, shifts, proves, unites, underpins, determines, expresses, guides, yields, ties, saves, approaches, maintains, looks, Comes, ranks, equals, hinges, Gives, pays, tends, owns, decides, mirrors, fits, processes, Leaves, marks, green, passes, singles, cautions, intends, Has, upholds, lays, wishes, talks, Tracks, conduct, conducts, heads, relays, runs, returns, echoes, hits, Catalogs, hints, claims, sums, attempts, allows, IMPACTS, calls, Tallies, causes, takes, becomes, happens, mode, spans, joins, tries, notes, accounts, looms, guy, puts, adds, model, benchmarks, sound, sounds, hopes, thinks, extends, favours, type, keeps, sets, stands, gets, ", lists, kind, accords, matches, states, amounts, finds, displays, meets, 's, plans, wants, builds, touches, deals, date, holds, base, Bases, acts, Recalls, covers, signals, says, Does, Forms. relies, acknowledges, regulates, alludes, emphasizes, reviews, Designating, requires, foresees, utilizes, proposes, entrusts, cites, applicable, fires, reads, concerning, submission, wears, asserts, consultation, appoints, Referrals, provides, Addresses, pursues, establishes, devotes, qualifies, insists, attaches, brings, serves, envisages, question, remits, subjects, expects, call, goes, concerns, draws, pertains, seeks. He never refers to himself as " Mahatma." This refers not alone to the natural conditions; there is a second wide field in the gardens - the hardy gardens - of others, where you can at once choose from the many and learn whether certain plants are too tender or require too much care for your use. reverie, Rob Roy, robber, riparia, riviera, ribier, Rapper, raver, robbery, raper, rubor, reviewer, Ruhr River, rivera, rubbery, rubber, roofer, revere, rapier, reefer, repairer, rebury, River Aire, roper, referee, revery, river, reaper, ripper, reappear, repair, rover.